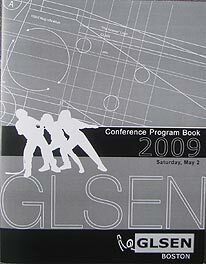 At May 2 conference organized by GLSEN, member of tax-supported Mass. GLBT Youth Commission! Here are some of the workshops that day. Here's what they're treaching the teachers (and kids). Did we mention that teachers get official state Certification Credits for doing this? Yup! 1. Getting the agenda into the schools - and keeping it there! This doesn't show up in a school by accident. It is very well planned and executed. This workshop gives activists the "tools" and "successful tactics" to get homosexual programs in schools past resistant administrators. Saul Alinksy would certainly be proud. How to infiltrate Catholic schools without raising red flags. Training in dealing with "difficult" people in the school community who oppose this agenda. More "strategies for responding to opposition", and turning around their arguments. How to set up a successful homosexual club for middle school kids. For teachers in urban schools, to get kids to promote acceptance of homosexuality in schools among their peers. How to train school officials to transform a school to be as gay-friendly as possible. Introducing books with "visible gay role models" for "gay teens facing the coming out process." 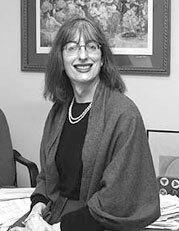 What is the "T" in GLBT? The "T" is transgender. A man in women's clothes led this "panel" about how kids can handle their attraction to transgenderism. This workshop for kids was about "exploring" homosexual relationships online. Presented by Trevor Wright, a transgender activist. Helping kids decide what to label themselves. The choices: Bi, lesbian, gay, straight, queer, questioning. Presented by an elementary school teacher in Newton, this is to "help introduce and teach children about queer families." Tying the homosexuality and transgenderism movements to racism, sexism, the bullying agenda. This man -- who dresses as a woman -- gave the workshop "What is the T in LGBT". He is an active member of the state-funded Mass. Commission on LGBT Youth and frequently goes to schools in that capacity. Presented by the "pastor" of a homosexual church in downtown Boston, it deals with a strange theory comparing anti-homosexual sentiment to making schools a prison. Usually this kind of ultra-radical gender ideology is confined to college campuses. But no longer! Let's bring it into the public schools! How to take an activist role in addressing "sexism, homophobia, and transphobia in schools." They love to pretend it's a spontaneous project of students, but that's just baloney. This workshop also provides "the tools to combat opposition and overcome obstacles relating to the Day of Silence." Members of Newton North High School's gay club talk about "the best ways to create awareness for queer issues at your high school." How to teach history from a homosexual viewpoint. "What happened in the LGBT community before you came out? Come learn about LGBT history in the United States." How to "reenergize" a school's homosexual club for kids. How to force changes in the school to support the "needs and experiences" of kids who want to cross-dress or claim to be "transgender". Kids' "gay rights" in school. This card was given out at the conference by the ACLU. HANDOUT to kids: What Students Can Do To Make Schools Safe For Lesbian, Gay, Bisexual, and Transgender People. Includes "low risk", "some risk", and "high risk activities! 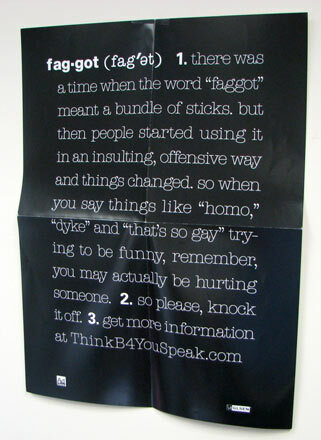 Posters given to kids on "That's so gay"
It drives the homosexual activists crazy that kids react to their agenda by making fun of it. "That's so gay" has become a common retort in school hallways, causing a new propaganda campaign to try to stop such "offensive" behavior. So they're handing out to kids these two wall posters. Our prediction is that, knowing kids, it will have the opposite effect. They'll say it more than ever, raising the cry by the homosexual lobby that we need more money for "anti-name calling" and, of course, "anti-bullying" programs! What kid would put this nonsense on his wall? This one's a little more clever, but still pretty stupid. 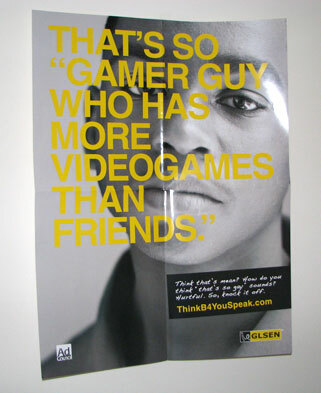 On top it says: "That's so 'gamer guy' who has more videogamrs than friends." On the bottom it says, "Think that's mean? How do you think 'that's so gay' sounds? Hurtful. So, knock it off. Conference also supported by corporations and teachers union! Starbucks Coffee, which seems to regularly support radical homosexual events. Harvard Pilgrim Health Foundation, the charity connected to the Harvard Pilgrim Health insurance group. They also march in the annual Gay Pride Parade. Why is a health insurance company underwriting something like this? We wish we knew. Interestingly, Harvard Pilgrim is run by Charlie Baker, a possible Republican candidate for Governor. Thanks, Charlie - you'll fit right in. This is what happens when things get out of control. This is what your tax money is supporting! And virtually all the major politicians in Massachusetts support it, too. Your kids are secondary to their ambitions. When the politicians vote en masse for money in the budget to give your money to the Massachusetts Commission on Gay Lesbian Bisexual and Transexual Youth it's not hard to tell where their priorities lie.